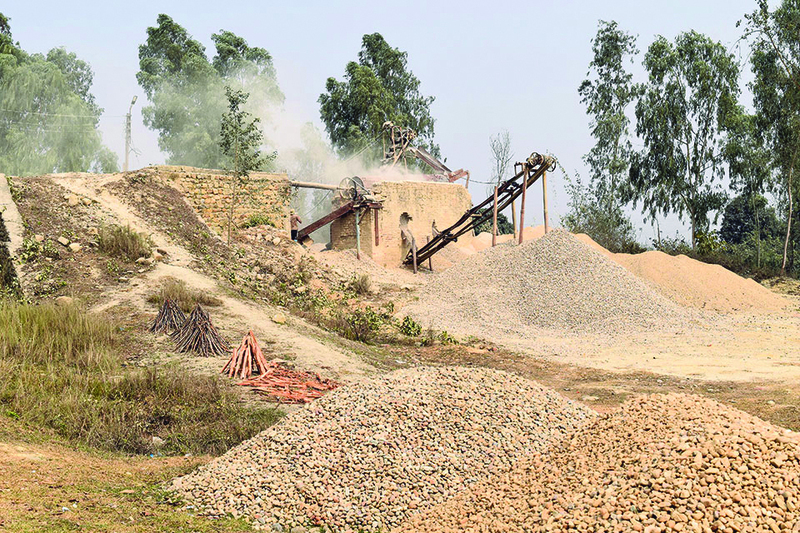 Republica Files A stone crusher plant in operation in Dang in this file photo. DANG, April 10: On Sunday, the provincial government of Province 5 unveiled its plans and policies in which it focused mostly on the development agricultural and industrial sector as the basis economic development. Though the government has set out agricultural development as its major agenda, which it claims to achieve in part by utilizing water in rivulets for irrigation, it has not set out plans for conserving the Chure region that is essential for preserving water sources in the region, among others. Locals claim that mafias continue to exploit jungles and other resources in the Chure region unabatedly. Felling of trees, as well as extraction of sand and stones from the rivers, continues unrestricted. Experts have repeatedly warned that the rampant and unrestricted exploitation of natural resources in the Chure region has been severely affecting environmental conditions in the region and that such environmental degradation might invite severe natural disasters in the region. “As long as Chure remains neglected, this region cannot develop. It must not be neglected at any cost,” notes Dr Shiva Kumar Subedi, an expert on Chure. “Until and unless we revive the natural order in Chure region and bring it back to life, water sources in the region will soon dry. Many water sources in the region have already dried,” he said. He warns that if exploitation of natural resources continues at the present rate, it will trigger natural disasters of huge scale and that such disasters will be not limited to the Tarai region. Subedi stated that the policy makers have still not realized the importance of preserving the Chure region to ensure sustainable economic development across the country. Citing its importance in the overall national development, he stressed that the federal as well as the provincial governments should prioritize its conservation at the policy level. Citing common understanding among farmers in the Tarai region, he claimed the farmers are aware that their fertile lands are gradually drying up and that despite using better fertilizers productivity has been declining over the past few decades. They attribute decline in productivity, he claims, to the destruction of Chure region. “In the past, most of these farmers were able to irrigate their farms from nearby rivers and rivulets. Now most of these water sources have dried up or have very less water. This has severely affected their farms productivity. So the magnitude of the problem is already high,” he said warning that in the long-term the impact of environmental degradation in Chure region could be even dangerous. According to Subedi, when sand and stones are extracted in excess from rivers, it is natural for them to dry up. Despite this fact, such resources are collected haphazardly from small and big rivers in the region in lack of monitoring by authorities concerned. Locals claim that trucks and tractors continue to extract stone and sands from the rivers day and night. Requesting anonymity, a local of Ghorahi stated that the power of stone and sand mafias is so high that no one dares to speak against them. “Though among ourselves we share concerns about the rampant mining of sand and stones from the rivers, nobody dares to question the practice. If you roam around the rivers and observer their activities, you are a threat for them and possibly your life is under threat,” he narrated. Flooding is another direct derivative of Chure environmental degradation. Unlike in the past, flooding has become very much unpredictable in the region. “When you interfere with nature, it responds in every dangerous ways. This is evident in the ever increasing numbers of floods and their intensity in the region,” he stated. Stating that dozens of villages in the region are already under huge risk of flooding he stressed on the need to tighten restrictions on the extraction of sand and stones from the rivers and mountains of the Chure region. Umaram Nepali is a resident of Haripauri, a village near Tulasipur. He is always in fear of floods from the nearby Gwar River. “I constantly fear that someday floods from the Gwar River will sweep away our settlement. I have contemplated migrating from here to safer place, but it's not easy either,” he lamented. 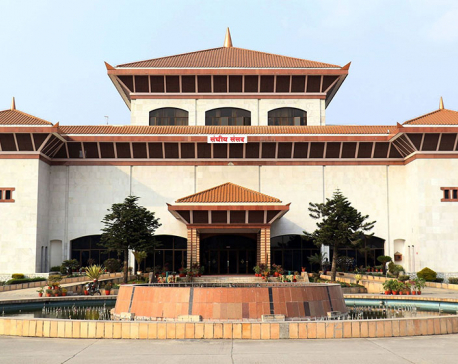 As a measure to safeguard the settlement, Nepali and other residents in area have approached relevant authorities for building dams along the river to control its flow. Gwar River has its fair share of mining mafias that continue to extract sand and stones from it. Due to excess extraction of the sand and stone, the river has changed its course over the years and now poses threats to settlements in its vicinity. People were expecting that the provincial government would address their concerns by focusing on efforts to conserve the Chure region. However, its plans and policies unveiled on Sunday were a total dejection in that regard. “Chure is getting fragile with every passing day. Something serious must be done immediately to address this. The provincial government must assume greater role in the conservation of the Chure region,” he stated.